Given in part by Al Vandenberg and Eric Franck. Supported by The National Lottery Heritage Fund. By the 1970s, American photographer Al Vandenberg (1932-2012) had abandoned his commercial career to take street photographs. Having studied photography in New York alongside Alexey Brodovitch, Richard Avedon and Bruce Davidson, Vandenberg became a successful commercial photographer and art director working in both New York and London during the 1960s. After a period of travelling, he settled in London in 1974 with the aim of using his photographic skills to create portraits of city life without a commercial agenda. Vandenberg’s series On a Good Day documents a wide variety of Londoners. He encouraged the people he photographed to engage in the process, creating portraits in which the sitters appear at ease. The people in this photograph wear the uniforms of London bus conductors. London Transport had a long history of employing British Caribbean people, which began as a result of labour shortages in the immediate post-war period. In 1956 they started a recruitment drive in Barbados, which was extended to other parts of the Caribbean in the mid 1960s. In 1968, London Transport estimated that they had around 9,000 black staff. The employment opportunities they offered contributed to the migration from the Caribbean in the 1950s and 1960s. The V&A acquired fifteen photographs from Al Vandenberg’s On a Good Day series as part of the Staying Power project. Staying Power is a five year partnership between the V&A and Black Cultural Archives. The project aims to explore black British experience from the 1950s to the 1990s through photographs acquired by the V&A and oral histories conducted by Black Cultural Archives. 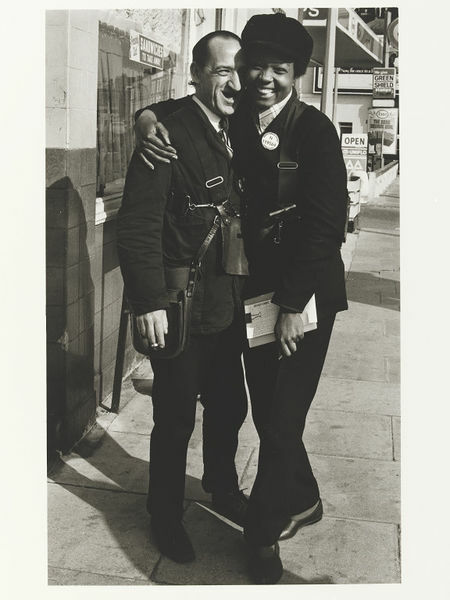 A photograph taken by Normski of his stepfather David Prescod wearing a London bus conductor uniform was also acquired as part of the project. Black and white photograph of a white man and a black woman in matching uniforms smiling and embracing on the pavement of a street. 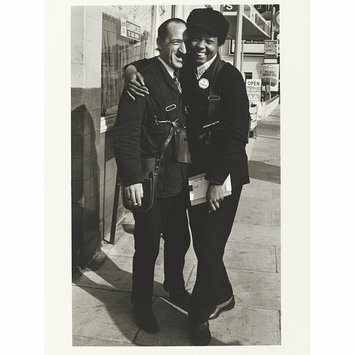 This photograph was previously titled 'Untitled [two parking officers]', but was changed as the subjects were identified as London bus conductors.